Even though Douglas Stotz's book Neotropical Birds, Ecology and Conservation, assigns a high research priority to the Bronzed-winged Pionus (Pionus chalcopterus), with the exception of 2 papers by Dr. Mauro Galetti, a book by John & Pat Stoodley, and web-published papers by Ana Sosa, there have been no formal studies published regarding this (or any) species of Pionus parrot (Stotz, pp. 166-167). While of great significance, these efforts only scratch the surface in terms of what remains to be learned about the natural lives of these parrots. 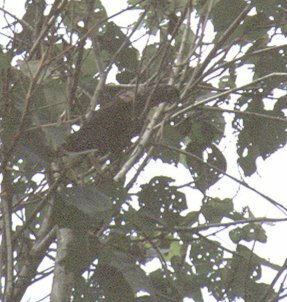 The PPRF conducted preliminary studies of three Pionus species - Bronze-winged, Coral-billed (P. sordidus), and White-headed (P. seniloides) - in Ecuador's Mindo Valley in November, 1999 and January, 2001. During the preliminary studies we observed large flocks of all three species and gained insight into flock behavior, feeding behavior, dominance issues and breeding behavior. In addition to the three species mentioned above, we also spotted a single Blue-headed Pionus (Pionus menstruus). 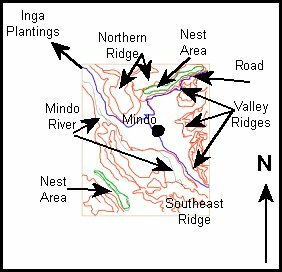 The Mindo Valley is a 33 square mile area with the northeast corner located at 00º 00' 00'', 78º 45' 00'' west and the southwest corner at 00º 05 00 south and 78º 50' 00'' west. The valley is on the northwestern slope of the Andean volcano Guagua Pichincha that produced phreatic eruptions on numerous occasions during our visits. The volcano is located in the Western Cordilla of the Andes Mountains. The terrain of the valley and surrounding areas is quite rugged; the elevation at the floor of the valley is 1300 meters and the highest ridges in and around the valley reach 1650 meters. 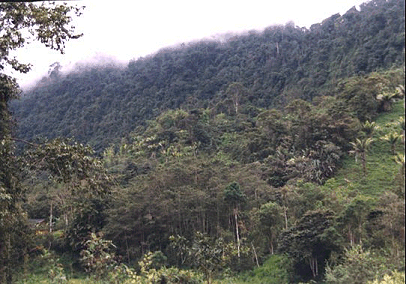 The region is a typical sub-tropical cloud forest. Much of the valley is immersed in clouds for extended periods throughout the day. There are no seasonal variations in the climate except during periods of El Niño and La Niña. The temperature ranges from 50 to 60 degrees Fahrenheit during the evening and 56 to 70 degrees during the day year-round. Roughly 30% of the forested regions of the valley have been fragmented over the past three decades by cattle farmers and plantation growers. Crops produced on these deforested areas include guyabo and other tropical fruit, coffee, corn, and small amounts of bananas. Beef cattle are raised in two areas of the valley, although herds tend to be small. Most families keep small flocks of chickens. There are no heavy industries located in the valley; most residents are farmers or farm workers, laborers, and shopkeepers. The valley's population ranges between 1000 and 1200 persons. The Mindo Valley was the first Latin American region to be designated an Important Bird Area by Birdlife International. Because of its isolation and relatively pristine condition, the area is home to over 1500 species of birds, many of which are migrant songbirds from North America. Parrots in the valley include Pionus parrots and members of the Pyrrhura genus. There are several species of hawks residing in the valley as well. Jane Lyons de Perez, Ph.D.
Jane is an American ornithologist who has worked in countries all over South America for the past 20 years. Her last paid position was as director of Birdlife International in Ecuador. Vinicio Perez was raised in Mindo and is a widely-renowned birding guide in the region. Together, he and Jane operate the Mindo Bird House where they provide guided birding tours for international groups and offer lodging and meals for the groups. Research assistants on the first trip were Mark Ziembicki, a doctoral candidate at the University of Adelaide in South Australia, and John Leydecker, an aviculturist from San Francisco, CA. Mark has already gained extensive experience with neotropical parrots and his assistance was invaluable. This was John's first experience with parrots in a wild setting. Research assistants on the second trip were Viviana Ruiz Gutierrez, a graduate of National University of Costa Rica with a major in Tropical Biology, and Julia Shade (my daughter). Viviana has worked as a birding guide and has served as a research assistant on other projects in Costa Rica. Julia is not an aviculturist and provided us with the opportunity to record observations that were not colored by avicultural training. The goal of the November 1999 study was to attempt to identify flocks of Bronze-winged Pionus parrots, record behaviors, and obtain information on their diet. Jane and Vinicio began several weeks before the other participants arrived by recording sightings of all three species of Pionus parrots. Once Mark and I arrived, we attempted to define the parrots' daily routine and then establish observation posts where we could watch the flock members interact. GPS and time records were kept for each sighting. Behaviors were photographed where possible. Mindo residents were queried regarding the parrots' diet and we observed the parrots feeding on a few occasions. 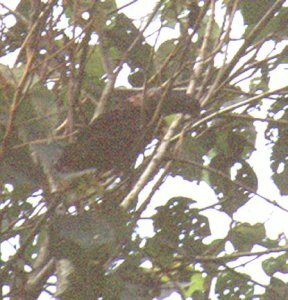 The January 2001 trip attempted to identify active nesting sites of Bronze-winged Pionus, record any breeding-related activity, and obtain additional diet information. We used methods similar to those used in November 1999. The total number of Pionus parrots sighted over the ten day study was 1,321 including a single Blue-headed Pionus. See section on Breeding Behavior - January/February 2001 for details. Sightings on the second trip were almost nonexistent. While we heard small groups almost constantly, we saw only seven small groups (less than six per group). We were fortunate to find a large flock of Bronze-winged Pionus parrots in a cornfield one half mile from the center of Mindo on the first afternoon. After only three days of intense observation we were able to predict this flock's movements to an accuracy of 15 minutes. Typically, the birds would first appear between dawn and 5:45 AM flying noisily on a southern track above the town of Mindo. By 6:00AM, the birds would fly into three tall trees on the northwest corner of the cornfield and remain there until 10:00AM. . At 10:00AM, the birds would leave the trees and fly south through the valley, disappearing over the southern ridge. 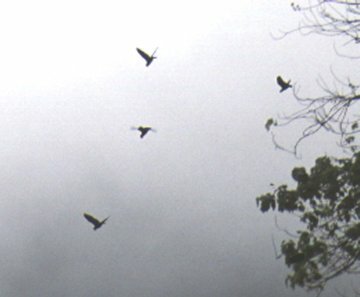 At 2:00PM, the parrots returned to the tall trees in the cornfield and remained there until 6:00PM (dusk) when they would depart, flying to one of the three deep ravines on the northern end of the valley. We believe that they roost for the night in these areas. Bronze-wingeds leaving the cornfield for the day. 1) Despite the many reports of Bronze-wingeds corn eating behavior, we observed the birds in the cornfield only once. We inspected the corn on several occasions and could find little evidence of the ravaging be usually described in other reports of Pionus's feeding behavior (Stoodley, 1984, p 11). Instead, we found small chewed areas at the top of a few corn ears. We could not find any evidence of corn grubs in the ears that had been chewed leading us to consider that the parrots may be eating corn grubs instead of the ripened corn. While it is true that captive Bronze-winged parrots will eat both dried and fresh corn (one source told us that Bronze-winged parrots feed their chicks a mixture of fresh corn and grubs), we did not see similar behavior in wild parrots. 2) We observed several instances of sentinel behavior, both in flying and perched birds. Flying birds. After two days, we were able to be in a lookout position prior to the arrival of the parrots. We could hear the approaching flock 20-30 seconds before they would drop out of the more or less perpetual cloud cover. At every instance, a small group of two to four birds would precede the flock - flying very fast and circling the field 7-10 feet above the tops of the corn stalks. If the birds noticed anything unusual (such as the blind we constructed), they would circle several times until they were sure that no threat was present in the field. When they entered the field the first time after the blind was built, they flew within three feet of the 6" diameter opening we had left in the blind's cover to accommodate the camera lens, surprising the inhabitants of the blind. Perched birds. Although not evident to us until after 10-12 hours of observation, the flock was never without a sentinel visibly perched at the top of the tree. Regardless of what activities were occupying the remainder of the flock, one call from this sentinel and the entire flock would instantaneously depart from the perch tree. After we returned from Ecuador and began examining the hundreds of slides we took of the perched birds, we noticed that the sentinel bird would be staring at the camera by the third frame (we often shot series of 10-12 photographs as quickly as the camera could cycle them - about 1.2 seconds per frame. This behavior was found in every single series we shot, leading me to believe that the bird heard the shutter even though it was 50 yards or more from the tree full of vocal, active parrots. 3) One widely accepted theory among aviculturists is that parrots have a dominant bird in each flock. Often called the flock leader, this bird, the theory states, takes the uppermost position in a tree presumably because he is less likely to be defecated upon. This bird, the theory continues, gets to eat first, gets the first choice of mates, and occasionally has to defend his position in the flock from challengers. During our observations one day, we watched with some excitement as a single Bronze-winged slowly climbed towards the bird sitting at the very top of the tree. Sure that we were about to see a challenge to the flock leader, we all concentrated on what was taking place before us. As the second bird climbed onto the highest perch with the flock leader, the flock leader began preening the second bird. As they continued with their preening, they slowly moved to a lower position in the tree and, as they did so, a third bird from lower in the tree climbed up and assumed the top position. No fights - not even vocalizations. We began to watch the top bird more closely in subsequent sessions and found this replacement behavior repeated many times. There was always a bird at the top of the tree, but the bird would relinquish its position without so much as a fuss if another bird approached. We think this behavior further confirms what behaviorists such as Steve Martin have mentioned and what other neotropical ornithologists have reported. We have been unable to find a single mention in neotropical ornithological literature supporting the flock leader theory and believe that our observations may help to hasten its demise. On Day 3 of the 1999 trip, Mark and I strolled through the field prior to the farmer harvesting the corn. We were looking for evidence of destructive feeding - we found that very few of the ears of corn showed any evidence of being gnawed. There were not partially eaten cobs on the ground or on the plants. We did find several ears that had been chewed for a distance of one half inch or so at the very tip. We find it hard to believe that birds typically accused of heavy corn eating eat such a small amount of the available corn. However, we must point out that John Stoodley reports heavy corn raiding by Pionus parrots as well. We had conversations with farmers and ex-farmers in the valley. All of them mentioned that the parrots were "always" in the cornfield and that several of the farmers had given up attempting to grow corn because of the parrots. Coincidentally, we found surprisingly little evidence of corn grub infestation. In the United States, pesticides are routinely used to control corn grubs. While we cannot venture a statement of fact, our suspicions are that the parrots are likely eating the corn grubs at the point where they enter the ears of corn. The PPRF plans to rent cornfields in the valley and hire observers to record and photograph the interactions of the parrots with the corn. 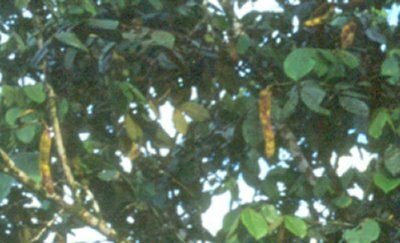 On Day 5 and Day 7 of the 1999 trip Mark spotted a group of 7 Coral-billed parrots eating leaves and leaf shoots in an oak tree (Quercus) on the southern ridge. We obtained voucher specimens that are presently stored at Pontifica Universidad Católica del Ecuador in Quito. On Day 6 of the 1999 trip we observed a flock of Bronze-winged parrots descend into a cornfield that had been harvested on the previous day. We did not, however, see any parrot eating corn, despite there being an abundance of exposed ripe corn ears on the ground. 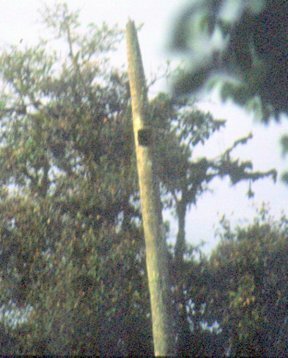 On the last day of the 1999 trip we were treated to an extraordinary sight, that of a flock of 40 or more Bronze-winged parrots descending en masse on a small chilca negra tree (Bacchiris sp.) on the western edge of the cornfield. This was our only experience with an entire flock feeding at once. The birds had been perched quietly in early afternoon when, right before our eyes, they took off as one and descended on the tree. Each individual frenetically leaped from branch to branch and we were not at all sure what they were eating. Interestingly, there was no bird standing sentinel while they were eating and we were able to get fairly close to the tree (approximately 30 feet).The bout lasted for 20 minutes. I took a branch with us when we left the area. When we arrived back at our base, I examined the branch, hoping to determine what they had been eating. There were flowers on the branch as well as leaf shoots. A small number of flowers had been eaten and a few leaf shoots, but certainly not of a quantity sufficient to keep so many birds feeding for so long. I also noticed that portions of the branch were covered with tent caterpillar feces, however, there was not any caterpillars or eggs to be found, although we did see some wisps of the white material they use to build their nests. I returned to the tree and made an identical observation. Although we did not directly see the birds eating caterpillars, some of the photographs I took revealed birds gnawing at the crotches of branches, far from where one would expect them to be gnawing if they were eating flowers or leaf shoots. Inga sp. with 12"-14" ripe pods. In their discussion on the topic of food availability vs. selectivity as it relates to breeding seasons in neotropical birds, Stutchbury & Morton cite literature describing how frugiverous birds most likely depend on high-protein insect food for feeding their young (Stutchbury, Morton, 2001, p 13). Additionally, work on Maximilian's Pionus (Pionus maximiliana) in Brazil during the period 1988-1991 shows little correlation between food availability and diet of this species (Galetti, 1993, p 420). 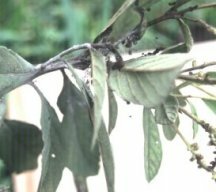 We suggest that in the case of the three Pionus species in the Mindo Valley, this ingestion of insect protein also occurs immediately prior to the building of nests. Our goals in 2001 were to identify active nesting sites of Bronze-winged parrots, record any breeding-related activity, and obtain additional diet information. When we arrived in the valley, we asked local farmers if they had seen any of the Bronze-winged parrots and almost to a person, they told us of a large Inga planting in the northwestern area of the valley. We failed to observe any parrots in that area. We traveled extensively through the southern and southwestern ridges and this time we saw several small groups of parrots. These parrots, however, were much more brazen and noisy than those we observed in 1999. We would see them only briefly, for example they would fly around a corner of a ridge and quickly go into the trees below us or vice versa. Their behavior was strikingly similar to the behavior of adolescent neotropical passerines (Stutchbury & Morton, 2001, p 68). These so-called "floaters" were apparently involved with active nests. As we moved through the southern, southwestern and northern areas of the valley, we noticed many freshly-chewed holes in the dead palm trunks. Since local farmers had told us on several occasions that the parrots nested in hollowed-out areas in dead palms, we suspected these might be nests that were either already in use or were being prepared for use. We set up surveillance at several of these sites, but failed to observe any activity. However three weeks after we departed, Dr. Lyons sent us mail telling us that she and Vinicio had seen Bronze-winged parrots using several of the locations we had recorded during our visit. It's possible that hens were already sitting on eggs in those nests. In our aviary, males feed sitting hens only once or twice daily - usually in the early morning and late afternoon. In the wild, early morning may actually mean pre-dawn. As a consequence, we probably did not arrive early enough to observe this behavior. The fact that the parrots had been sighted frequently in the preceding days eating heavily of Inga correlates with Galetti's observations that the parrots eat the fruits (seed pods) from September through March, dramatically increasing their consumption levels as the breeding season approaches ( Galetti, p 422).. The seeds themselves are 18.9% protein (by weight) and pods have a protein level of 10-12% ( Duke. 1983.). Klasing's work describes the strong need birds have for increased protein ingestion both prior to and during chick-feeding periods (Klasing, p144-146). Based on our observations and the work cited here, we have altered protein content of our aviary birds to match these figures. The dietary observations we made during both of our trips correlate strongly with information recorded by both Galetti and Stutchbury & Morton. Longer studies of Pionus diet are needed to accumulate data such as preferred foods and percentages consumed at different times throughout the year. We have identified the breeding season of the Bronze-winged Pionus and have gathered sufficient data to permit us to set up better surveillance at breeding sites, using video cameras and human observation. Finally, it is important to note that the three species living in the Mindo valley all have successful, self-perpetuating flocks in spite of the ever-increasing levels of human activity - including forest fragmentation and construction activities. This leads us to think that, at least for these three species, their highly adaptable nature will permit these flocks to escape eradication, barring collecting behavior by humans. While the pipeline that will probably be constructed in the valley will most likely have a deleterious effect on other non-psitticine species, we doubt that Pionus populations will suffer significantly. The behavioral features that contribute to Pionus parrots surviving successfully in the wild contribute to their amenability to captive environments. Galetti, M: Diet of the scaly-headed parrot (Pionus maximiliani) in a semideciduous forest in southeastern Brazil. Biotropica 25(4), 1993, pp 419-425. Klasing, K. C.: Comparative Avian Nutrition, CAB International, New York, 1998. Stotz, D, et al: Neotropical Birds - Ecology and Conservation, University of Chicago Press, Chicago, 1996.